Otherwise known as ' Trouble '. Tilly is the one who looks like butter wouldn't melt in her mouth. £55 + £2.50 shipping in the U.K, £4.50 anywhere else.SOLD thank you. Tabby is the quiet one, who needs to be rescued from her sisters. She likes to hide away and sleep on her tummy. And Tinker ? Well, Tinker is the *spirited* one ..
Who doesn't like to sleep at all. Due to constant fighting, I'm afraid they need to be separated. 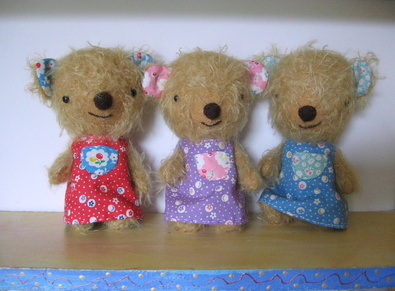 These little girls are 6"/15cm tall, made from twirly-curly mohair, with a cotter-pin jointed head, thread jointed arms and legs, and 100% wool stuffing. 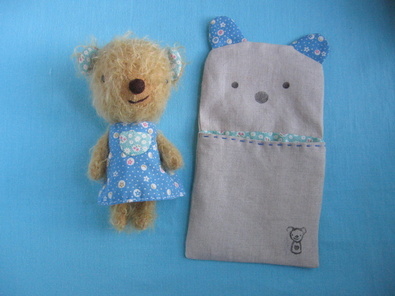 They are wearing lined, removeable dresses, and come with their own matchy-matchy snuggle sacs. They're so sweet,I could eat them up!Your toys always have such a cute look! So, so precious! I wish I had the cash to adopt Tinker! I love them,they're super sweet and look so beautifully crafted. I can tell you love what you do. I love the photo of them fighting - poor tabby is taking a real pasting. Just like the good old days when me and my sisters were younger and fights were a necessary part of rainy days. They are very alike, and yet they all seem to have their own character. It's really amazing! But these girls have a good sense of humour, of that I'm sure! too cute. how do you make them so tiny? do you hand sew them or use a machine? 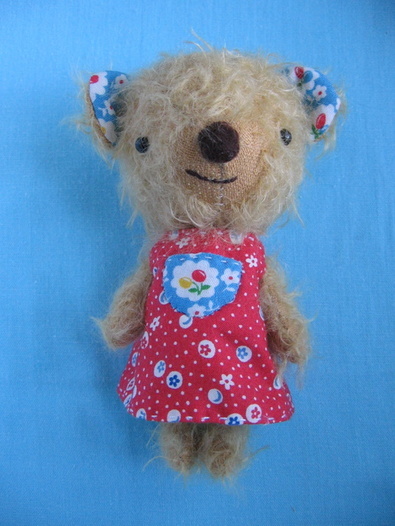 I bought a wonderful book about tiny teddies but I have been much too intimidated to even try! Oh my goodness. 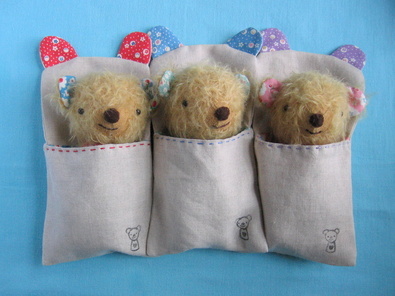 I love the mischievous smiles and the transformation to pure sweetness they take on when tucked into their sleep sacks. I echo Anna's comment; these gals really turned my mood around today--and are helping me to feel inspired to get going on my own bears already. I don't know why I can't make the plunge yet. 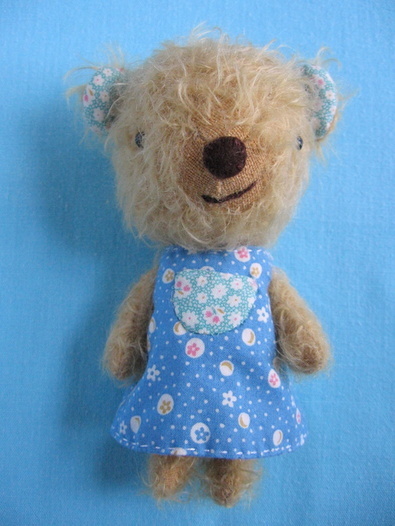 One must have to be in a beary sort of mood I suppose. Anyhow Tilly is my kind of gal. ooooh so sweet! I always love the little stories you have about your dollies, too. Really makes them come alive. Great job!! "Due to constant fighting, I'm afraid they need to be separated." 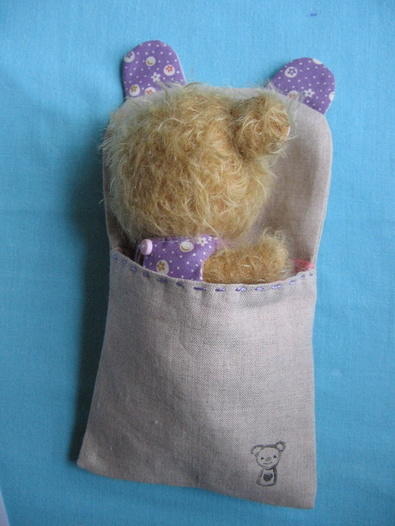 The bears are adorable and the sleeping bags are the BEST! They are a great idea! I cannot tell you how much I LOVE your little fellas and gals. It makes me believe in the Velveteen Rabbit. Love the sisters! I enjoy how you let us get to know their personalities. That last picture of them all snuggled up together is just adorable! Such cuties. So cute! I love their little smiles. I LOVE the triple trouble with their mischievous smiles - how do you do that? They seem to be alive - and somehow I think that you must have that same mischievous smile while crafting them and then spinning your stories! Wish I could afford to buy one! I'm definitely not checking favourite blogs enough - I've missed out again. They are lovely, my daughter would adore them all...and me too. 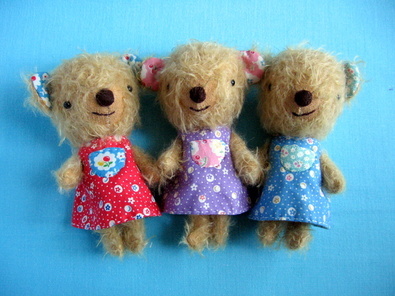 Gorgeous little bears...they're so cut and funny. And love the flowery dresses. OMG. 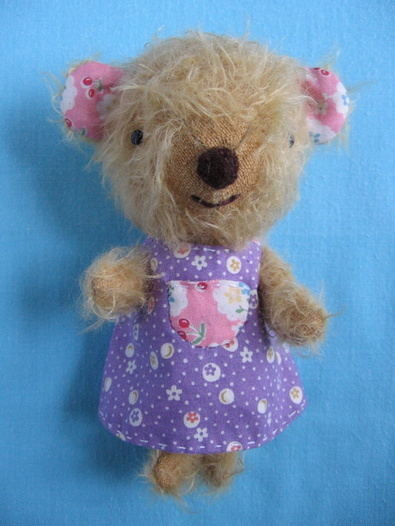 i just love the little bears you make. 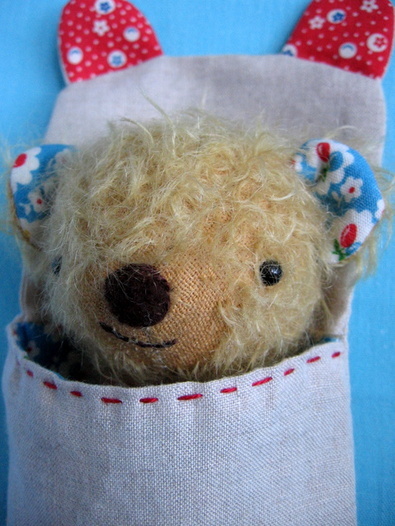 (well, everything you make, actually), but these bears just knock my socks off. they're beautiful and full of character. the sleep sacs are over the top. i'm going to pass out from all the cuteness!!! As always your creations are absolutely GORGEOUS! I show them to my children who just adore your cute stories. You should publish children's books. When I was little one of my favourite books was the story of a vintage doll and I would look at the photographs for hours. Those little bears made me squeal out loud with glee! What a wonderfully talented person you are, and so generous to share your tutorials with us. 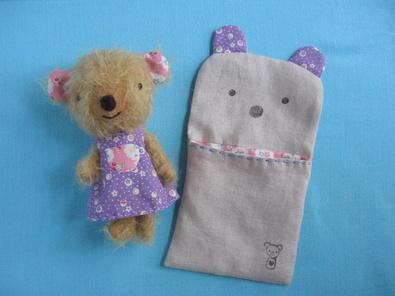 I am looking forward to making some things for my little ones. off to a good home!! Aw, they're killing me with their cute! :D Sweet little bears. The wedding story was FANTASTIC! Awww, cute. I have to say I always love seeing what characters you have brought to life. Such fun!! Hoooo I love it! so cute! 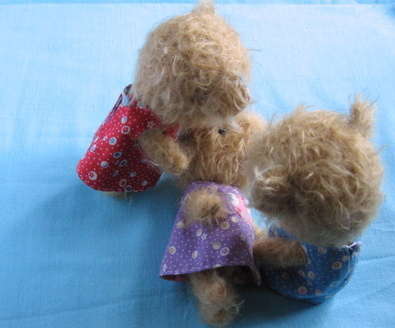 As usual the bears are just adorable and their stories had me laughing!! Hope that they are happy and just a little bit mischevious in their new homes!! I just happened upon your blog, and I've spent the best part of the last hour enjoying what you have here. I too am a crafter, and your work is very inspiring for me to get off my rear and finish off some of my many WIPs and start some new ones I've seen here, like your patchwork handbag. It's stunningly gorgeous! I have to make myself one. Lord knows I have the fabric to make trillions of them like yourself! You are very talented; keep up the beautiful work! Oh no! Are you sure they won't be sad to be separated. They sure are cute little girls! Just to say they are soooooooooooooooOOOOOoooo nice !!! oh, my, those are too cute. I am in awe...in AWE! oh wow, are those ever so cute. 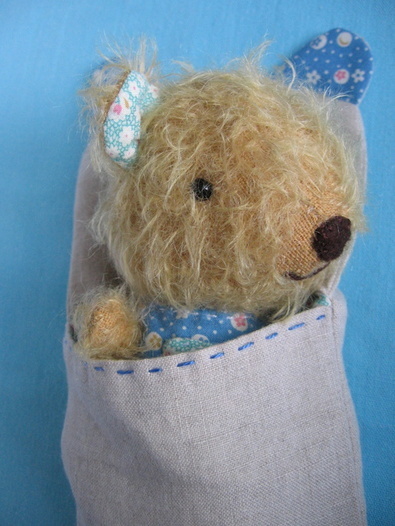 Where do you get the fabric you use to make your bears? And what type did you use for these? 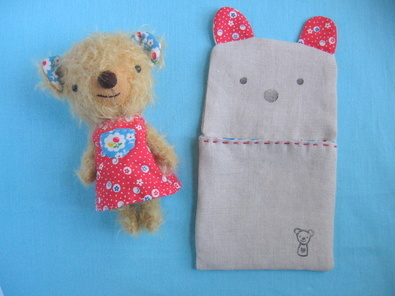 How can you make such cute litle bears!?!?... I just love them, very much!